I loved this book. Beautiful writing, frightening honesty. A pleasant read, but uncomfortable as well, as I identify so closely with all that the author is saying. This is one of those books that I read and think, “Man, I could have written this book.” But the truth is that I probably would never have written this book. It is much too painful to be this honest. 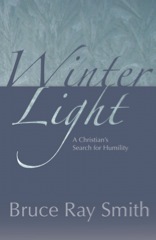 ‘Winter Light’ is the journal of Bruce Ray Smith as he seeks and explores humility and what it means to be humble. It is his reflections on his own pride and sinfulness…It is his journey of repentance and surrender and failure. Who of us cannot identify with that in our own lives, especially as it relates to pride? Most times we probably don’t even realize that pride is at the heart of our sin…It is the driving force and the root of our sin. Bruce Ray Smith places his heart upon the page in this book…many times as I read, I felt as if my heart were there with his. I have a feeling it may take me a while to recover from this read…but I plan to return to it often. I received a free copy of this book for review. I was not required to write a positive review.